Celebrate the 100th anniversary of the National Parks. 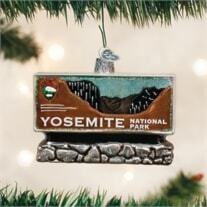 Yosemite National Park Ornament - California s Sierra Nevada mountains contain Yosemite National Park. Millions of people from around the world visit the park to take in its incredible sequoia trees, Bridal Veil Falls, the granite cliffs of El Capitan and Half Dome. Made in China. Gift Boxed.